I made homefries, and for the first time ever they didn’t take a million years to cook. They came out magnificently. I never could really understand what the trick was – aside from the times that I made homefries from leftover potatoes that were already boiled. These were just what I needed on a slow and overly grumpy morning. They came together really well, and went really nicely with a few slices of french toast made with the newfie bread that I made the other day. 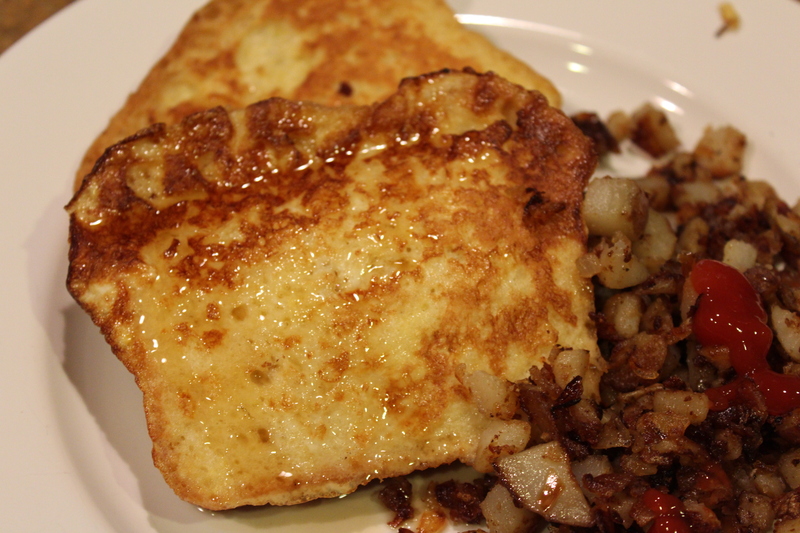 Slice the bread nice and thick, and add a little bit more of the vanilla to the french toast recipe, and maybe even a drop of maple syrup in the egg mixture. Good to go. Put chopped potatoes in large microwave-safe bowl, add 1 tablespoon butter, and cover with a piece of plastic wrap. Microwave on high for 5 to 7 minutes, shake up the potatoes halfway through cooking to make sure they cook evenly. 2. While your potatoes cook, melt 1 tablespoon butter in large skillet over medium heat. Add your onions and cook until softened and golden brown- remove from skillet and put aside in a prep bowl. 3. Melt remaining 2 tablespoons butter in recently emptied skillet over medium heat. Add potatoes and gently pack down with spatula. Cook, and when the underside of potatoes is brown,turn and cook evenly on the other side. Turn down heat and cook for another 15-ish minutes. Eat with copious amounts of hot sauce. All it took was the microwave. Seriously. This is what I’ve been missing out on. 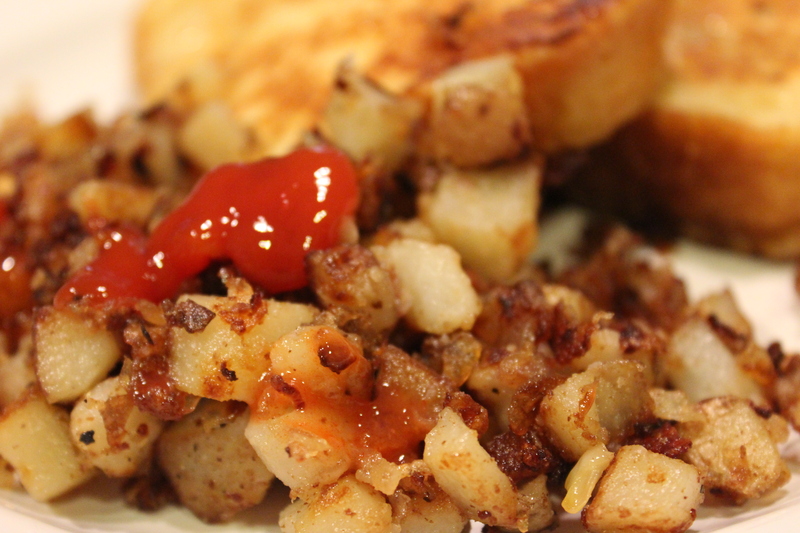 Oh yum, love home fries and sad to admit I have never made them myself. Everytime I eat in a diner for breakfast the eggs always come with them and they are pretty sad. Yours look absolutely perfect. I love the idea of microwaving them first thats genius really, I am going to give this a try. 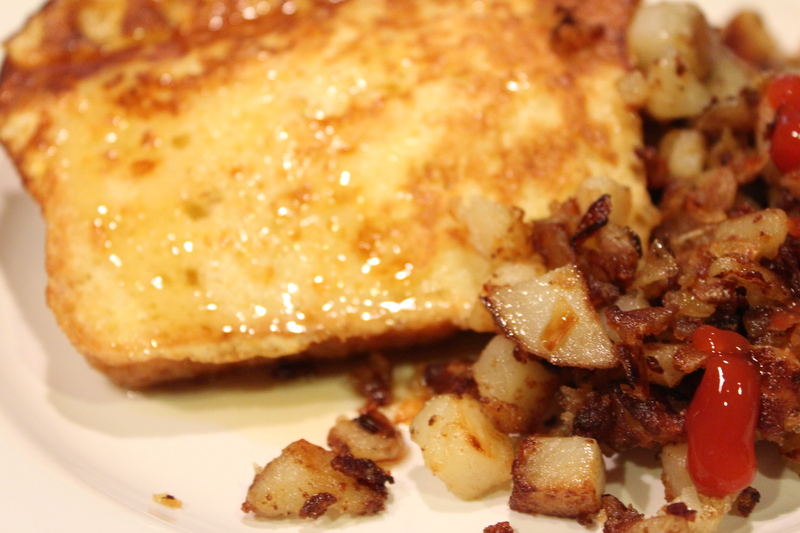 Your french toast looks great! Of all the EASY things I’ve never thought of… Microwave them! Simple as that! Sheesh! They’ve come out about this well with leftover potatoes before, but it was like a lightbulb turned on for me when I saw this spelled out. So simple, and yet I’d never think of it myself.